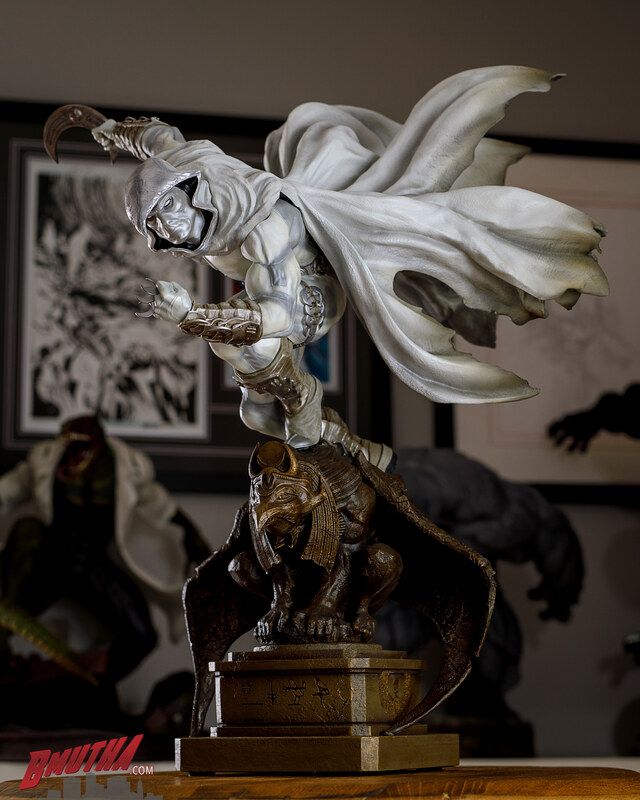 XM Studios Moon Knight has arrived…all four of his personalities, too! While we work to put together a full review on this statue, please enjoy this unboxing video and the teaser image below. Oh, and just a note, the gap issues with the heads have been sorted out…more on that in the review! DID YOU KNOW: Marc Spector acts as the avatar on earth for the Egyptian god of the moon, Khonshu. Marc is granted enhanced strength, durability, and reflexes; however, the effectiveness of these abilities fluctuates with the phases of the moon (a full moon provides the most powerful enhancement). Moon Knight is also an expert martial artist in many disciplines (including Kung-Fu, Ninjitsu, Karate, Judo and many more) and an Olympic level athlete. Couple these powers with his technological gadgetry and savage array of weaponry (he routinely uses crescent moon shaped throwing stars, a bo-staff, a truncheon, and spiked brass knuckles) make him a frightening sight for criminals! Posted in Unboxing, XM Studios and tagged Marvel, moon knight. Your reviews and pictures are spectacular. Keep it up amazing stuff.